This was a 2006 capstone project for three students at ITT Technical Institute in Tucson Arizona. 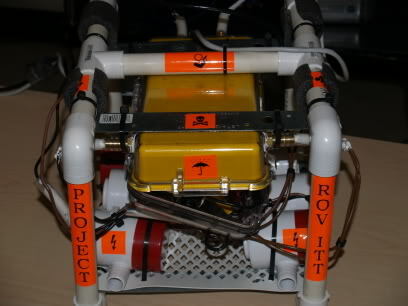 The project is a shallow depth submersable ROV, with RS232 communications. The team included myself and two lab partners Ron and Tom. We had a budget of about 300 dollars. We brainstormed several ideas, including one which would be a giant rubber duck floating a pool, measuring water quality and dropping chlorine pellets when required. After a few days of research, we found that, at that time, electronic monitoring of pool water quality was quite difficult and expensive. So we set off in a new direction. I had always wanted to build a submarine, and thought it would not be that difficult. I had already been a reader of an online ROV builders message forum. We settled on a design with a pvc pipe frame, water tight Pelican case to house electronics, and submersable bilge pumps as our drive motors. Modifying the case to accept cabling from pumps and the top side umbilical involved drilling and tapping the acrylic case. We inserted compressor hose barb fittings and sealed around them with silicone. Wiring was passed through a length of matching hose, and one end was sealed in with silicone. The wire was then passed through the hose barb, while the hose pressed around the outside of the barb, creating water tight but removable interface. We opted for leaving the bilge pumps unmodified. So, rather than convert them to propellers (which could theoretically opperate in reverse), we used them to provide a thrust jet of water. This meant the craft was much slower than desired, and required more pumps, but made the overall design simple, with less mechanical work to accomplish. The craft carried 6 pumps: Left and right sides front and back, and up and down. Thus, four pumps opperated in a way to drive the craft much like a tank would drive. to go forward, the two aft pumps would push the craft. To rotate right, the the right fore and left aft pumps would push against each other. These were all driven by power darlington transistors. If I were to do this project again, three modified pumps would be the option I would choose, powered by H-bridges. We also installed a camera in the case. Our umbilical brought power and communications down to the craft, and returned the video signal.